When you think of mosaics, you might think first of large art pieces like those found in some churches. 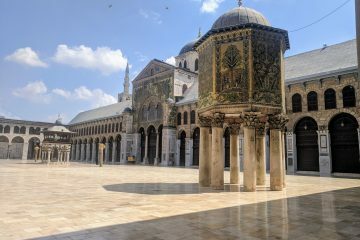 Big, wall-spanning images tend to get the most attention, making it easy to overlook the supporting players: the mosaic borders that surround or accompany those images. Mosaic borders have unique uses in modern interior design, though, so they’re worth a second look. How have these borders been used throughout history? 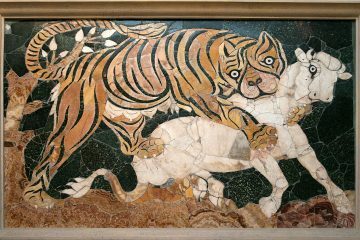 Mosaics, as we know them today, began in ancient Greece. Floor mosaics have been found dating back to the 6th century BCE, but in the early 1900s, historians excavating the ancient Greek town of Olynthus made a discovery – the floors in some Olynthus homes were much more detailed than previous floor mosaics. These floors, in homes belonging to wealthier Greeks, featured elaborate depictions surrounded by mosaic borders. Artists had created the mosaics with pebbles: mainly white pebbles in a black background. The Olynthus mosaics and their borders are from the 4th century BCE. Sometime after that, mosaic artists began to shift to using cubed tiles, or tesserae, instead of pebbles. The popularity of tesserae for mosaics grew, and several techniques for their use developed. Opus tessellatum, the most common, was used for large-surface work and areas that didn’t need to be as intricate – such as borders. This style used tesserae of usually four millimeters or larger. 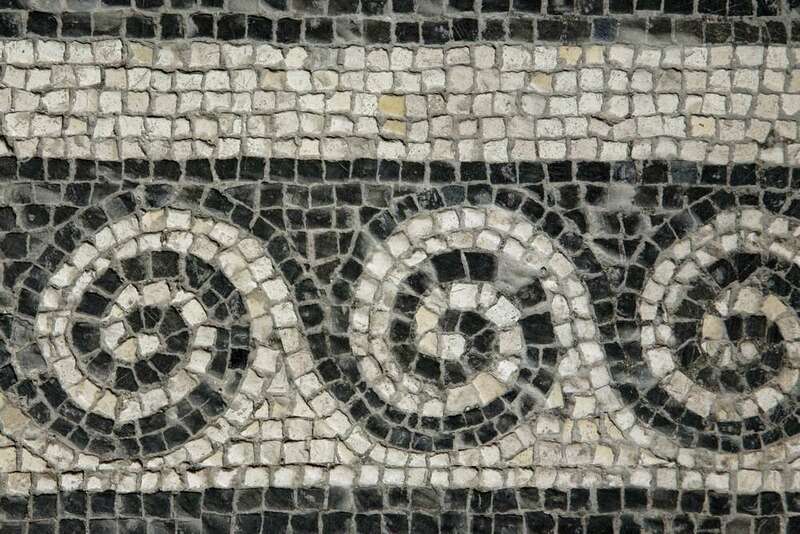 Mosaic border styles in ancient Greece were varied, but two favorites were the Greek fret, also known as the Greek key, and the running-dog pattern. 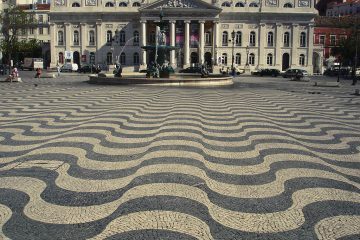 These designs are similar in that they are both made of lines forming repeating, often wave-like shapes. Frets have straight lines, giving the appearance of a sort of squared-off wave, and the running-dog pattern looks more like a traditional wave with curved lines. While mosaic borders often featured as floor decorations in the ancient Greek world, they also surrounded artwork such as emblemata. 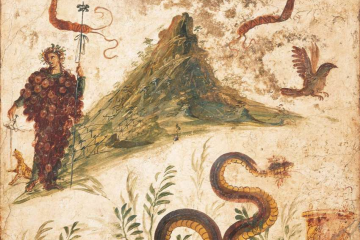 An emblema was an incredibly detailed mosaic typically made with the opus vermiculatum technique, which used tiny tesserae allowing for more intricate designs. These detailed images were then surrounded with borders, often in geometric designs such as the fret or running-dog pattern, using opus tessellatum. Mosaicists in the Roman Empire continued to use Greek mosaic art designs and techniques. The Zliten mosaic, from around the 2nd century AD, depicts Roman life, from everyday scenes to fighting gladiators, and is surrounded by a mosaic border in a black and white pattern. And in the ruins of the ancient Roman city of Pompeii, which was destroyed by a volcanic eruption in 79 AD, excavators have discovered mosaic borders on the walls in homes that were buried under ash. 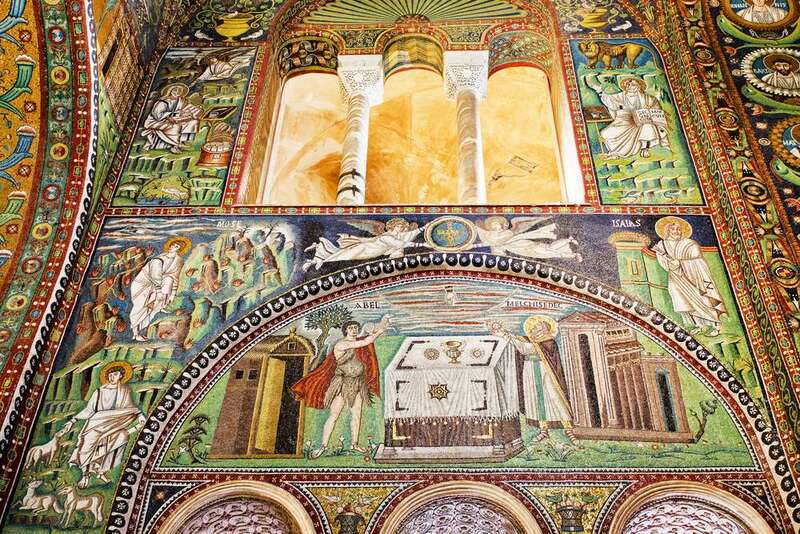 Many of the most well-known examples of mosaic borders since the Roman empire have been in Catholic churches. The Basilica of San Vitale in Ravenna, Italy, in fact, is considered such a historically significant piece of Byzantine art that UNESCO declared it a World Heritage site in 1996. Mosaics are located throughout the church, with many of their scenes and portraits surrounded by mosaic borders in different colors and patterns. Modern mosaic art still relies heavily on classical techniques and influences, as seen in the Cathedral Basilica of St. Louis, Missouri. This church features famous mosaics throughout, which were built, along with the church, over several years in the early 1900s. The Blessed Sacrament Chapel mosaics, which were designed by George D. Barnett and installed in 1916-17, include intricate, colorful mosaic borders along the chapel’s archways. The Royal Albert Hall in London, while not a church, features a mosaic frieze border around the outside of the building. It took two years to arrange the tesserae that make up the 800-foot long frieze. The Hall itself, which was constructed beginning in 1866, is dedicated to the advancement of art and science, and the scenes on the mosaic frieze are meant to illustrate that purpose. Mosaic borders have endured throughout modern history. And while the most famous ones often surround mosaic artworks in churches and ancient buildings, mosaic borders make for a stylish addition to your home as well. 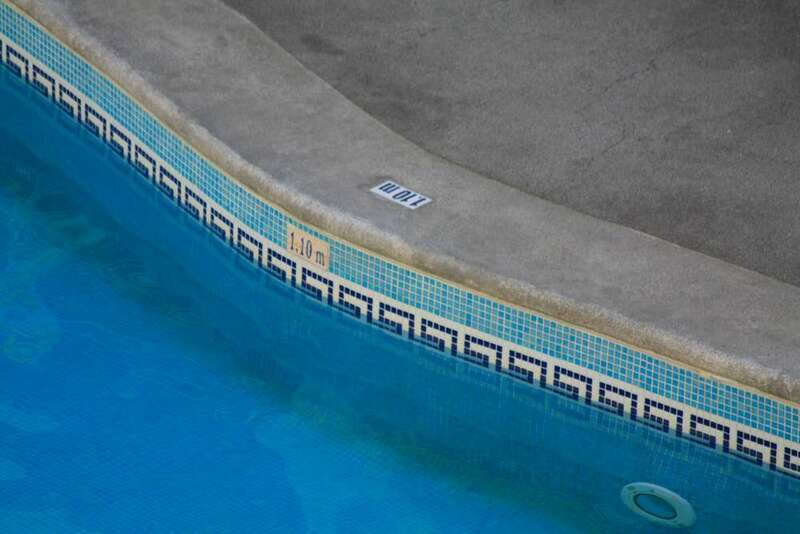 Common spots for borders are along kitchen or bathroom walls and the top edges of swimming pools, at the water level. These long, unbroken surfaces provide the perfect space for a mosaic border to shine. If you’re considering adding one to your home, remember that classic designs are classic for a reason – you can find Greek keys and running-dog patterns in many modern decor elements, including mosaic borders – but other repeating shapes or images are options as well. 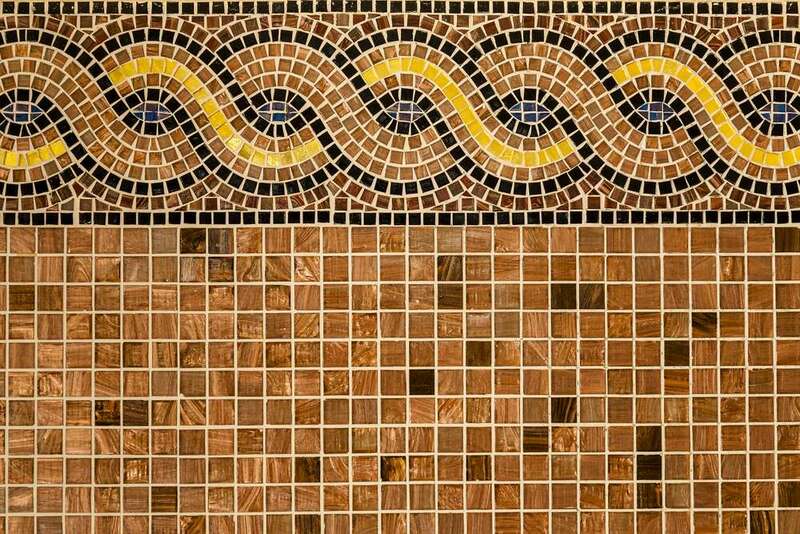 Whatever you choose, your mosaic border will share roots with techniques and artwork thousands of years old. Mosaic in Your Garden? Why Not!